Virginia is a hub of scientific exploration. Its proximity to NASA and Washington D.C. makes it one of the most diverse locales for scientific learning on the East Coast. 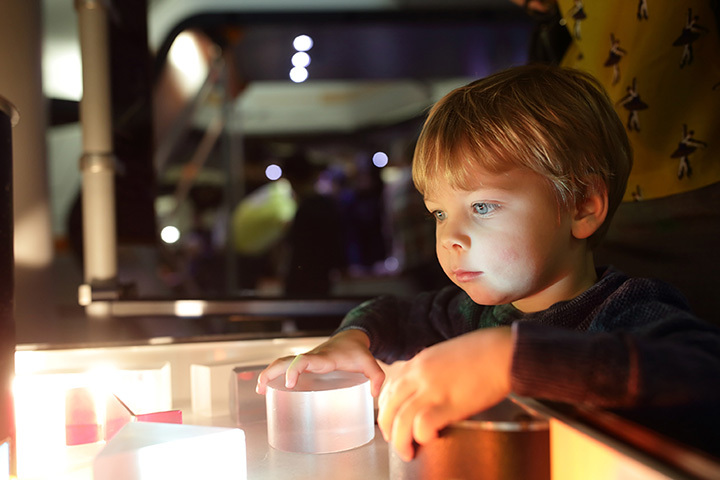 Experience your eureka moment at any of the following 10 science centers. The Virginia Aquarium and Marine Science Center in Virginia Beach, Virginia, is home to over 700 species of marine life. With regularly updated exhibits, hands-on experiments, IMAX theatre, boat trips, and more, there’s always something exciting going on at the aquarium. The aquarium offers educational activities for visitors of all ages. The Danville Science Center is located in an historic train station in the tobacco district of Danville, Virginia. This hands-on science center offers live science programming to teach kids about kinetic energy, animal adaptations, fossils, vibrations, and more. In addition, outreach programs and teacher resources bring the center to local schools. Regularly scheduled events, such as “Science After Dark” in which visitors “gaze through telescopes and see firsthand some of the wonders of the nighttime sky” are available throughout the year, so make sure to check back often. The Science Museum of Virginia aims to be a bulwark for science, technology, engineering and mathematics (STEM) through its exhibits, technology, and artifacts. Originally a train station from the early 1900s, the building was converted to the Science Museum in 1977. Since then, thousands upon thousands of guests have enjoyed live science demos, hands-on science labs, ever-evolving exhibits, and the Dome, an immersive theater experience. The Children’s Science Center was founded to provide a place for children in Northern Virginia to have hands-on experience with scientific fundamentals. Since opening in the early 2000s, the center continues to expand with even more plans for the future. The center was developed “by kids for kids,” with input from the visitors helping to shape the hands-on experiences. The Experiment Bar allows visitors to try a rotation of different experiments. Mad Science of Central Virginia in Glen Allen prides itself on providing fun as well as education. In addition to the elementary and preschool workshops, camps, and birthday parties, Mad Science offers after school science clubs with one goal: Getting kids excited about science. The Archeology Museum in Alexandria, Virginia, is a different kind of science center from the others on the list. It doesn’t focus as much on STEM, but instead “highlights one city block to provide a fascinating glimpse of Alexandria’s history and the way in which archaeologists study the past.” Generally, the focus of the museum is on nautical discoveries. Plenty of volunteer opportunities abound. The Challenger Center is technically in Washington D.C., but its proximity to Alexandria makes it an honorary Virginian institution. Named for the Challenger space shuttle, the center simulates a space station. Visitors receive various space related missions. Future astronauts won’t be able to get enough. The MathScience Innovation Center in Richmond, Virginia, offers opportunities for kids from all grades to learn more about the STEM field. Programs for professional development as well as different grade levels include AP Statistics conferences and the Let’s Innovate program. The center helps put on the Metro Richmond STEM Fair every year. The Virginia Air and Space Center in Hampton, Virginia, is one of the 14 visitor centers celebrating NASA. Exhibits include aircrafts, space crafts, the Space Quest immersion game, and many more. Educational opportunities for students, teachers, and scouts are available, too. View more Virginia Science Centers.